This book is aimed at the reader who has already had some experience with storytelling and is ready to learn more. Given the authors professional background, much of the book is focused on 'performance storytelling' so may not seem all that relevant to those that are interested in storytelling in other settings (particularly business/organisations). However, I particularly enjoyed the chapters on 'What is a Story? ', 'Learning the Story' and 'Discovering the Meaning'. The information in these chapters is valuable and applicable to all storytelling, regardless of the context/environment. Compared to 'The Story Factor', 'Improving your Storytelling' is a more practically focused book and offers more 'how-to' type information.My notes from the book can be found on Webby Clare. This storytelling book seems to be a little more formal and full-of-itself than the previous ones I've read but it does make some interesting points. Intro: The author talked about being in the moment when story telling - focus on the story you're telling now, not the way you told it before or will in the future. And don't think you can coast once you "figure it out" b/c there's no such thing. The author mentions a storytelling triangle in which the story, storyteller, and audience make the points of the triangle and are all connected. (However, the story and audience are connected by a dotted line b/c you have no direct control over how the audience connects to the story. )Chapter 1: Oral language. The author gives ideas for exercises in expressing feeling using only tone of voice and gibberish words. Eye contact "rules" can differ by culture. Dare to pause! Use repetition to emphasize certain things. Keep the "stage" uncrowded b/c it can be hard to do more than 2 characters during storytelling. Ok, it's quickly becoming obvious that this book is to help experienced professional storytellers hone their craft. It deals with exercises that you might expect for actors to explore their characters' motivations, expectations, etc. So, not really what I expected/needed but there are some useful things. Chapter 2: Imagery. People store images in different ways, such as visual, auditory, kinesthetic, verbal/conceptual, and olfactory. You can develop some of these senses w/ your storytelling imagery if they're not already strong. Chapter 3: Imagine certain scenes fully to be able to give more detail if needed (using the senses listed above, although the author recognizes that you'll probably never need to imagine the scene that fully. Chapter 4: Kinesthetic Imagery. Muscular, movement, posture) The author related an interesting personal story about the expectations and emotions conveyed by his [unintentional] posture during a tense situation.Chapter 5: What is a story? The format of a story (one climactic ending vs. several stories strung together by a common theme, etc.) can very depending on the culture, etc. Chapter 6: Learning the Story. This chapter contains an interesting anecdote about learning to tell a personal story, how it develops (i.e. that it is or should be based on the reactions of the audience).Chapter 7: Discovering the Meaning. The author suggests that we figure out the Most Important Thing (MIT) to help us tell it. The MIT to you could be different than the MIT for someone else and it can change. Chapter 8: Discovering Structure. There are different ways to outline the story to help you remember it and tell it to emphasize the things you want (depending on your MIT). Chapter 9: Memorizing. Don't begin by memorizing, try to get the gist first. Chapter 10: Helper & Beneficiary. Usually the audience is the beneficiary and the storyteller is the helper but the roles can be reversed in situations of therapy or if the storyteller is practicing, etc. The storyteller needs to be clear about the roles up front so there is no confusion. He mentioned a tactic for letting young children know that they were going to have an enjoyable experience rather than be lectured to by doing something silly (like pretend you don't know how to hold your guitar, the book, etc. )Chapter 11: Four Tasks. Uniting (the audience), Inviting (relaxed confidence), Offering (the story), Acknowledging (your audience). Chapter 12: Your Effect on Listeners. "Leaning forward" is the term the author uses to indicate that the audience is engaged and on the edge of their seat, esp. in tales of wit and humor. "Leaning Back" is the phrase he uses to express a relaxed, transported state of listening, like to fantasy tales. Chapter 13: Program Planning. Transitions can unify different stories or distract from it. The author talked about planning the story programs and also about situations where stories just pop into your head at the "wrong" time, when it may actually be the right time for someone. Chapter 14: Developing Audiences for your needs. You need different types to practice on. Chapter 15: Your Voice. Yawning heals. We have a lot of ingrained habits we need to be aware of. Don't forget to do vocal warmups. Chapter 16: Performance Anxiety. It can be good if it energizes/excites you but too much will produce fear. This chapter discusses processing fear and speaking to common worries (like if you forget everything, just move on, memorize sayings like "But what you don't know about ____ is _______" and if you really forget everything, go to another story by saying, "Let's leave Jack for a minute..." and start something else. Chapter 17: Support Team. This can consist of hired help, parallel playmates (like someone you get together w/ to write w/, even if working on separate projects), barter buddies (someone you trade favors w/). Chapter 18: Flexible Shifting of Attention. 4 layers = story, audience, yourself, and judgement. These can change depending on the story, audience (e.g. preschoolers vs. adults), etc. Chapter 19: Balancing the Details w/ the Goals. Think in the present, keep the MIT in mind, be present emotionally, show how much you love the story, offer the story as a gift to the audience. The book also includes an appendix w/ links to story telling organizations, websites, etc. Bibliography, notes, etc. 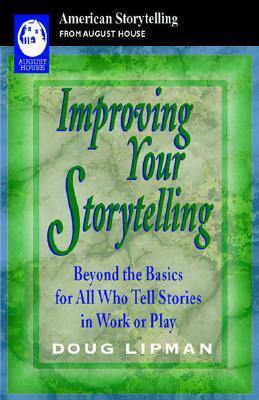 This book has a lot to teach about how to become a better storyteller, mostly in a more or less professional setting. The author shares his knowledge about the triangle of storytelling: the story itself and how you can make it fully yours, you yourself, and the audience and how to connect with the audience. You can tell this book was written from experience and not from research. Expect few references to other materials and mostly stuff learned while doing - which is perfectly legit by the way. The chapters on body language and transfer of imagery were most helpful to me. The tone and writing of the book could use improvement (it's rather formal and somewhat know-it-all) but the info is solid. I'm no professional storyteller by any means, but I did appreciate diving into the world that Doug Lipman lives in. He discusses in detail how the storyteller, the story, and the audience interact in a single storytelling event. He also gives advice on how to improve.I appreciate Lipman's chapters on picturing the scene, the Most Important Thing (MIT), story structure, and relating to the audience. I primarily read from a perspective of storytelling through video, but I think there are principles at work in his view of storytelling that work across genres. I liked this book; I'm glad I read it. Another excellent resource from Doug Lipman (see his Storytelling Coach book for a great read on how to help others learn to tell stories). Doug uses five sections to address the many dimensions of storytelling: 1) Transfer of immagery, 2) your relationship to the story, 3) your relationship to your listeners, 4) your relationship to yourself, and 5) putting it all together.An easy to read and understand guide to becoming a better performer. I read this as a way to improve my storytelling, not as a professional storyteller, but as a non-profit worker. I definitely enjoyed the way a multitude of subjects were presented, and the tips that came with it. Intended for established telelrs who seek to improve their craft rather than beginners.Not what I need for introductory workshop. A practical and psychological approach to storytelling. Very handy to have around, good advice and rather therapeutic to read. Looks like a good overview for storytelling and really readable.